World of Tanks: Christmas Event Sneak Peek - Defender incoming? Christmas is almost here and this year we will get yet another special event dedicated to it! 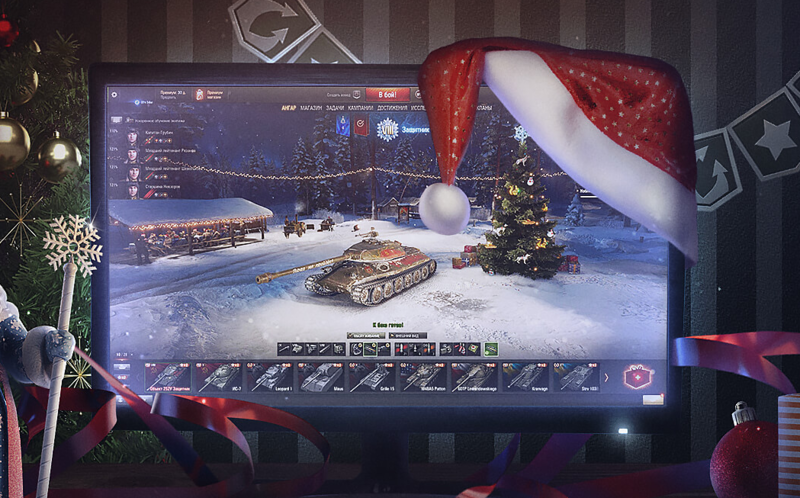 During this amazing time, we all love to share presents and spend time with our loved ones, or you might want to buy a present and use the free time to play some more tanks? Last year Wargaming prepared a special hangar, filled with activities and “present” boxes that made everyone get loads of goodies, for a price. And 2019 isn’t going to be much different. The event hangar will return to the game, but this time in amazing HD and with some modifications, players will be able to buy boxes and open them for amazing surprises, in exchange for some money of course, and last but not least the free goodies and extras you will be able to get win by completing the collections and levelling your Festivity to Level X! You will be able to decorate your hangar as previous years, collect items and craft new ones as you require. But you must be wondering what will we be able to get in those juicy Gift Boxes… Well, the image suggests you might be in luck if you are looking to get an Object 252U, as it could be making a return during the festive season. During 2017 Christmas event, players were able to get four different tanks, T26E5, Lorraine 40t, Skorpion G and the legendary Type 59. Record numbers of the Chinese legendary medium tank were given away, maybe this year Wargaming might spice things up by including a Defender in that list. We will have to wait and see. I just laughed an unhealthy amount with the idea of a Defender in the gift boxes. Not that I care about the Defender as I don’t really like the tank or think it is drastically OP but it just brings out the salt among the players. Type59 legend is over, people bought it from boxes in 2018 and how many of them you see on the battlefields? I’ll say this for them, they’re boxes aren’t rip offs, like almost every other company out there. I spent a hundred Euros and did not get a single Premium VIII tank. My guess is that Wargaming reduced the chance to loot two or three days into the event, because initially people looted lots of Tier VIII’s, but after the two days the reports of successful draws decreased markedly. It’s one of the oldest tricks in the world, and since Wargaming did not reveal the actual winning chances (like official lotteries are required to do) there was no chance to prove they had tampered with the values. If anybody feels like having a go this year, my advice is to do so right at the start or not at all. I for one have certainly learnt my lesson. I agree. The chance of getting better loot seemed higher in the beginning, as lots of people reported receiving premium tanks quite often, but also at the end. I got three premium tanks in the last few days, among whicht the Type 59 on my main account. Its probably because you estimated the odds where higher. If you look online then only those that get good stuff will brag about it. I hot a 59 Out of a crate. However, there were a LOT more (rare) tanksand a truck load of gold too… Which was way more worth then 100…. I give them that. Perhaps it was just to get a good reputation or so… Aka waving the carrots… So be careful non the less. ,59 is well rounded… But not a miracle. Strange there is no news about it on the official website?